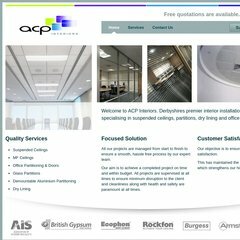 acpinteriors.co.uk ACP Interiors - Derbyshire specialists in Suspended Ceilings .. It is hosted by Media Temple Inc. California, using Apache/2 web server. PHP/5.3.15 is its coding language environment. ns2.mediatemple.net, and ns1.mediatemple.net are its DNS Nameservers. PING www. (205.186.187.167) 56(84) bytes of data.